Candlemas, or the Presentation of Jesus at the Temple, is one of the Twelve Great Feasts, celebrated by the Eastern Orthodox Church. It's celebrated annually on February 15 according to the Gregorian calendar. 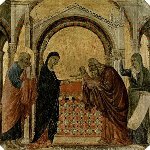 Candlemas is the feast of one of the major events in life of Jesus Christ, the day when Mary and Joseph took their baby to the temple in Jerusalem. Candlemas in Eastern Orthodox Church is a unique feast. It combines elements of a Great Feast of the Lord and a Great Feast of the Mother of God. The feast is celebrated with an all-night vigil, that is held on the eve. The next morning the bees wax candles are blessed. First the priest reads four prayers. During the fifth prayer all present bow their heads before the God. The priest blesses the candles with holy water. When the candles are distributed among the people, the Divine Liturgy begins. Eastern Orthodox Church also practises the Churching of Women. This tradition died out in the Western Christianity, but not in the Eastern Orthodox Church. During the ceremony all mothers, who recovered from childbirth, are blessed.